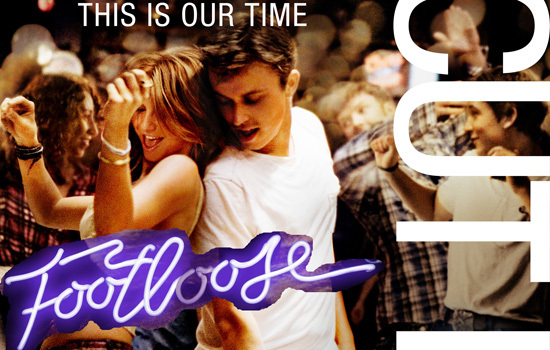 Directed by Craig Brewer (Black Snake Moan, Hustle & Flow) Paramount Pictures and MTV Films presents this “Footloose” remake that opens with a care-free and fun dancing scene to the title song “Footloose” by Kenny Loggins from the original 1984 version. Tragedy soon follows and suddenly the small town of Bomont (population 19,300) turns into one with strict uptight laws much of which are targeted at the town’s youths. Julianne Hough & Kenny Wormald star. This is the town that Ren McCormack (Kenny Wormald), a senior in high school is sent to from Boston, Massachusetts to live with his Uncle Wes Warnicker (Ray McKinnon) and family. The rude awakening comes when he discovers the town is desolate with a lack of technology and strict laws against dancing, drinking, and an 11pm curfew enforced on minors under 18 years all of which came about under the suggestions of the town’s preacher who lost his only son in a tragic car accident also taking the lives of four other teens. Making a decent effort to fit-in, Ren finds an immediate connection with classmate Willard (Miles Teller) originally played by Chris Penn, who soon becomes his non-dancing new best-friend. Ren is quickly labeled as a “trouble maker” by the school administrators and the town’s preacher, Rev. Shaw Moore (Dennis Quaid), portrayed by John Lithgow in the 1980s version after a “disturbance of the peace” violation and being set-up for drug possession. Things become extra difficult when Ren and the preacher’s daughter, Ariel Moore (Julianne Hough), an adrenaline junkie, have a mutual attraction for each other. Conflict emerges between Ren and Ariel’s current car racing boyfriend, Chuck (Patrick John Flueger) and her father. “We can not be missing from our children’s lives. They are ours to protect” Rev. Moore preached to re-affirm the local laws. The only way Ren can blow-off steam is to dance in private. After deciding that one of the changes he can bring about to Bomont is by starting a petition to make dancing legal again, Ren puts his best foot forward and pleads his case to the city council along with the support from his classmates. This remake of “Footloose” keeps the core fundamentals of the plot line along with the right amount of simplicity to create the same magic that was in the original. The film makes an appreciative homage to the ’80s decade by re-introducing hair band “Quiet Riot”, country super-star Tanya Tucker, and Deniece Williams’ “Let’s Hear it for the Boy” that famously served as the backdrop song for Willard’s dance training montage. As true as the film stayed to the classic, however, was as equally disappointing at the lack to bring it more up-to-date by using more modern-day hits. A little bit of Usher, or Justin Bieber should have been an order to include. Starring character roles played by Kenny Wormald and Julianne Hough were executed on point. Wormald, who is a professional dancer, managed to live-up to the iconic role originally played by Kevin Bacon which made him a star. Perhaps Wormald will command the same reaction? Julianne Hough very well may have super-stardom on her hands once this film opens. In her first-ever break-out acting leading-lady starring role, Hough, also a professional dancer previously on “Dancing with the Stars”, played Ariel magnificently! The role of Rusty was infectiously revived by actress Ziah Colon (Drop Dead Diva), a part originally played by Sarah Jessica Parker. Andie MacDowell’s role as Vi Moore, the preacher’s wife seemed to be lessened in this remake. Vi was such a strong Matriarch character in the classic that it would have been nice to have seen MacDowell not get blended-in to the background of the story. Ultimately, the heart of the story is misjudgements on first impressions and about the daughter/father relationship between Rev. Moore and Ariel and their struggles to get over their own hurdles created by the tragic loss they shared of a brother and son. The young adult viewers were genuinely engaged in “Footloose” and expressed their enthusiasm once it ended. If this 2011 version of “Footloose” has anywhere near as close of an impact as the first one did, then the movie will do well. 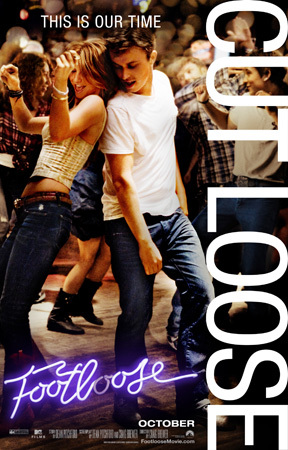 “Footloose” opens in theaters October 14, 2011. I was a fan of the original “Footloose” movie because of the awsome soundtrack and great cast!!! !